“Crack” is a term thrown around a lot in videogame circles. World of Warcraft, Puzzle Quest, Diablo, Smash Brothers, Lumines, Halo multiplayer – I have heard all of those games referred to as that nefarious drug. If those games are crack, Roogoo is straight black-tar heroin mixed with crystal meth, served with a cool glass of absinthe. Roogoo is an upcoming Xbox LIVE Arcade puzzle game. Developed by SpiderMonk Entertainment and published by SouthPeak Interactive, Roogoo was my favorite (and probably the best) game at the NYCC. 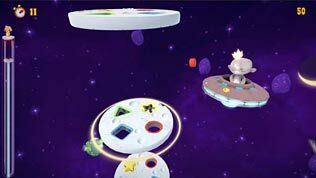 In one long sentence, Roogoo tasks players with matching falling “meteors” of varying shapes with corresponding holes by rotating a disc the holes are located on. 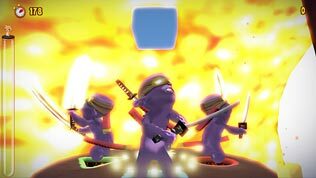 The game takes literally one minute to learn – disc rotation is controlled by the left/right bumpers or triggers, A speeds the descent of the shapes and, in multiplayer, Y dispatches a “Meemoo” (a purple monster) that blocks a hole until dispatched by a sped-up block drop from a press of the A button. Discs will also begin to have a “number of shapes” requirement before dropping to the next level. I can hear the screams of frustration as players frantically spin disc after disc to get that tenth triangle down, only to be foiled by a Meemoo or misfired spin. Another layer of depth is the butterfly. These jerks will randomly appear just when you think you’ve got a stack of shapes through. The camera will switch to a view looking up from below and your stack will float upwards instead of down. You now must rotate the discs in the opposite direction in order not lose the stack. Oh, and you just lost some progress thanks to a freakin’ butterfly. In my multiplayer session with with fellow That VideoGame Blog editor Matt, it was a simple race to see who could get every type of shape to the bottom first. You could also lose by having too many shapes lost (not dropping in the right hole or being blocked by those damn Meemoos). At the end of each level, we were shown how many shapes we lost and what percentage of shapes we guided through. Although we did not play this mode, according to a press release, there is a co-op mode where two players control the same “machine.” I can only imagine how many friendships will be ruined from missed drops or disc spins. If you couldn’t tell from names like “Meemoo” and the games title itself, Roogoo has a kiddy aesthetic to it. Bright colors are abound, the presentation is simple and easy to digest – it feels and looks like most puzzle games, accessible to a wide audience and is completely E rated. Look for Roogoo on XBLA and Windows based PCs by the end of April – and beware of spinning discs and falling shapes haunting your dreams in the near future.